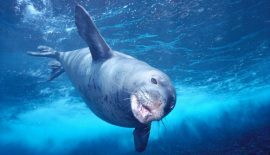 Hawaii Marine Animal Response (HMAR) is the field operations arm of Hawaii Marine Mammal Alliance and we count on generous tax-deductible donations from people like you. Hawaii Marine Mammal Alliance is a 501(c)(3) non-profit charitable organization and our federal tax ID is 81-1077953. Help us offset the costs of staff, insurance, vehicle expenses, supplies, equipment and other costs to maintain our field response, outreach and dispatch & reporting operations. Your donations help us produce the materials and purchase the equipment used in our education programs so our children become stewards of our precious marine mammal resources. Your donations create a revenue base that we may use to pursue matching funds grants from government agencies and private foundations. Your donations help us develop fundraising campaigns and special events that bring awareness to the need for preservation of Hawaii’s protected marine species. You can help us defray the costs of telecommunications services, computer equipment and online systems used to create, manage, store and distribute the critical field data generated by our activity. Make a one-time or recurring donation to help Hawaii’s protected marine species.